Last weekend Terri asked me to work on finding a new home for our hot tub. The hot tub came with the house that we purchased in 1994. We enjoyed it for a while, but then got out of the habit and thought it would be best to sell it or give it away to someone who would use it. 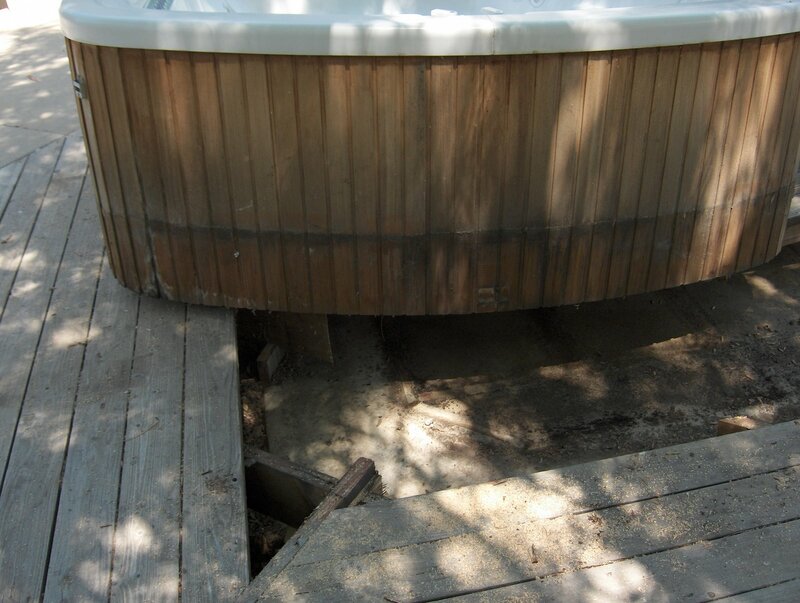 Paying to heat and maintain a hot tub can be expensive, particularly when it needs repairs. Our last repair bill was nearly $800 because it required replacing the heater box, recirculating pump, and some of the tubing. It was also leaking and that was repaired at the same time too. I put an ad on Craigslist and attached the picture above letting anyone know that if they wanted the tub, they could have it for free if they moved it themselves. Prior to placing the ad, I had called the hot tub store and asked what it cost to have it professionally moved and they told me it would be around $300-$500 depending on the complexity and about $100/hour for every hour extra they need to spend. They also told me the model of hot tub I had weighed about 900 lbs. In about 4 hours after placing the ad for a free hot tub, I had 9 responses from interested parties. That evening a guy stopped by to look at it and while he was here another guy showed up also wanting to take the tub. I suggested a coin toss to which they both agreed and that resulted in a winner. The coin toss winner said he’d come back with some friends and equipment to retrieve the tub a few days later. I told him I’d work on removing some of the decking to make it accessible. The main problem was that the hot tub was built into our redwood deck. 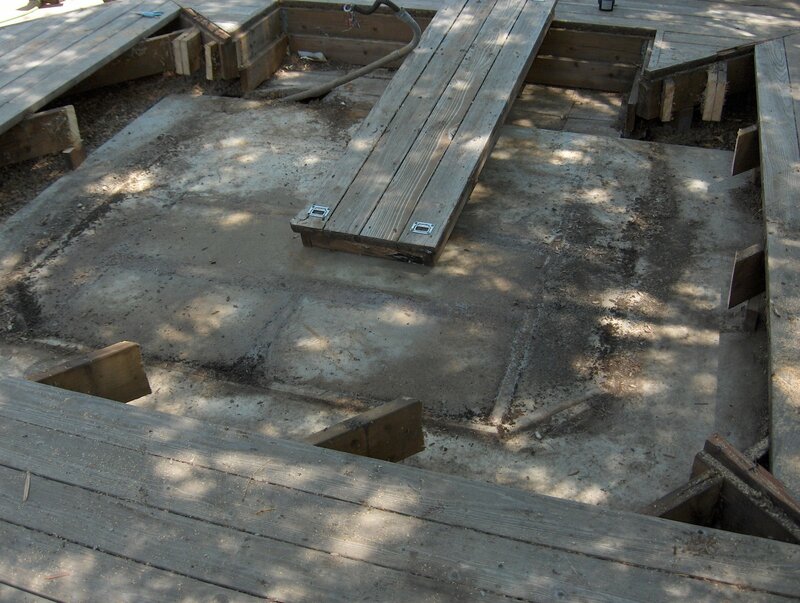 Actually, the deck was built around it like a jig saw puzzle because the hot tub was installed on a concrete pad before the deck was built. 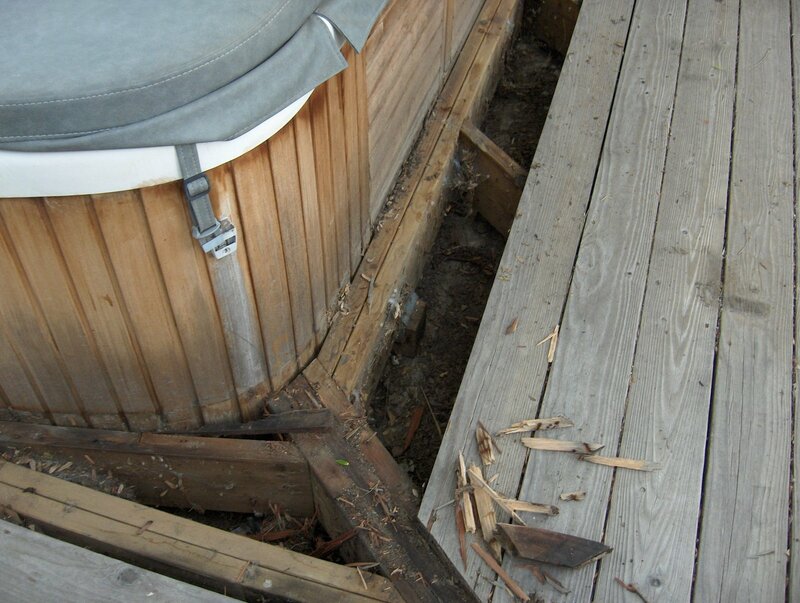 The floor boards on the deck are attached with long wood screws, so I didn’t anticipate a problem removing them…. until I actually tried to do it. Most of the screws were screwed well below the wood surface, up to a half inch deep in some places, which caused the screw head to disappear below the surface of the deck. This also caused the holes to fill with dirt and wood, so before I could remove most of the screws, I had to first excavate them. I used a drill with a Forstner bit to remove the wood above them, then an exacto knife to clean out the dirt in the screw heads and then a right angle screw driver to provide enough leverage and get them started so that I didn’t strip out the heads. It took me a good 5 hours working in the heat to get enough boards out of the deck to find out that a much bigger challenge lay ahead. The hot tub had a massive frame built around it and I would have to remove that frame before the tub could be lifted because we couldn’t get anything under the tub to lift it out with the frame in place. I removed a few more floor boards and then used a Sawzall to cut the joists, which worked for the stringers, but there were a few parts of the frame that required cutting through stringers that had been doubled or tripled, so I pulled out my chainsaw. A chainsaw is an interesting tool to use for working on a beautiful redwood deck. But in a surprisingly short time, I had severed enough joists and members in the frame so that Terri and I could lift the frame away from the hot tub. After we got this taken care of, our buyer showed up with 3 friends along with a flat bed trailer and a pair of flat dollies. He was well prepared with various tools, and yet we were still unsure of how we would lift the 900 lb tub up out of the hole it was set down in. One guy suggested we just try to lift it as he had done with his hot tub. I thought that couldn’t hurt as long as we took it easy so between the 5 of us we found that it was in fact possible to lift the tub. We got one end of it up on the deck only to find we forgot to remove the wiring. Oops. We put some wood under the dangling end of the tub while one guy took care of unwiring it. Then we tilted it up on end, on to the dolly, so it would fit out through the gate which was about 4 feet wide. One guy had built a small ramp with bricks and plywood to roll it safely down the one step between the patio and the sidewalk and then we wheeled it out to the flat bed trailer. The whole ordeal took less than 20 minutes and would have take half that had we remembered to unwire it first. It was quite a relief. Now the tub is on its way to a new home where it will no doubt see much more use that it had here. And I have a large hole in my deck that I had to fill in and you can read about it here. This entry was posted in household repair by Lee Devlin. Bookmark the permalink. THank You very much for posting this with photo’s – your a GEM!!!! i too bought my home in 1991 with hot tub. 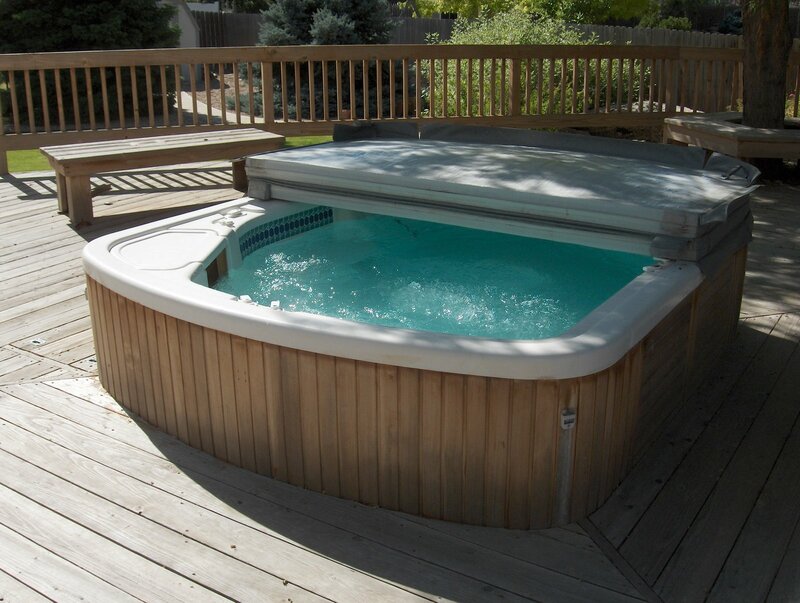 It is hooked up to Pool filter/heater – pipes go underground to hot tub. i wish to give the hot tub a new home – since i have not used it in over 5 yrs. it all works well – and seats 10-12 people. but – i want a greenhouse vs. a hot tub. THANK YOU AGAIN for the eye opener. Even I have a hot tub on my backyard’s deck and it is of no use. I am also thinking of removing it.